Montreal festivals this December 2018 are abundant because, after all, it's the holiday season. Artisan fairs, parades, carols, freebies, and sparkly decorations multiply as Christmas, Kwanzaa, Yule, Hanukkah and the New Year approach, each in due time, with a backdrop of first snowfalls covering the city's nooks and crannies, and a canopy of ice crystals glimmering in the light. It's a beautiful month to be in Montreal. Everyone of every faith is invited to enjoy the holiday season and its delightful, heart-warming events. Montreal's best Christmas events include Place Ville-Marie's Christmas tree lighting, Christmas markets including the Place Jacques-Cartier market and the Jean-Talon Market, both great destinations for artisanal-quality gifts. Le Grand Marché de Noël de Montréal (The Grand Christmas Market) is the official holiday shopping destination in Montreal and in 2018, it's moving to a new home in the heart of the Latin Quarter between De Maisonneuve and Ontario streets on St. Denis Street. December 15 to December 31, 2018, enjoy Pointe-à-Callière's annual event, "Who Is the Real Santa Claus" featuring holiday characters showing children how the holidays are celebrated in their respective homes. Not everything has to cost money when the holiday season rolls around. 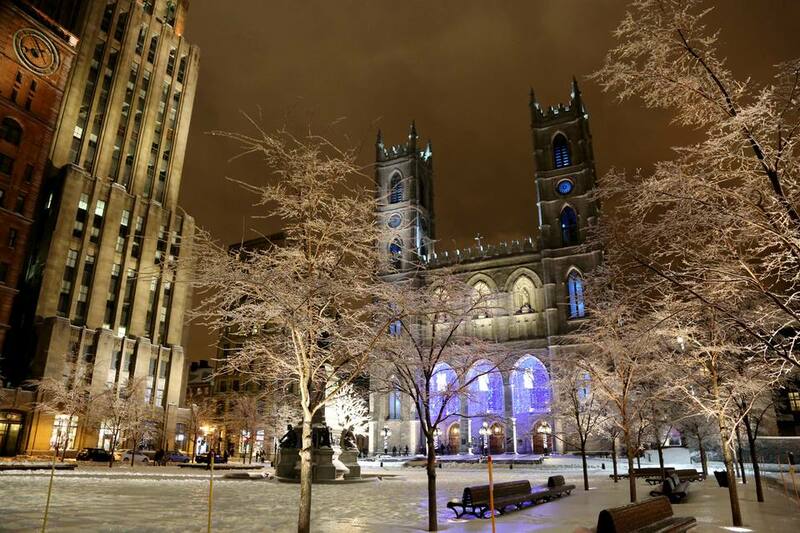 Here are some great free things to do in Montreal this Christmas season. To save more money, head out with a full Thermos of hot tea or cocoa. It costs nothing the browse the Christmas markets and sample the gourmet treats offered at some. There is free entry to markets such as Old Montreal's Christmas Market at Place Jacques-Cartier. One of the best events for last-minute holiday shopping, which is also completely free to attend, is the Salon des Métiers d'art, a giant exposition of artisan crafts opens in Montreal in early December 2018. You can also shop at Le Grand Marché de Noël de Montréal, a Christmas market at Place des Arts' esplanade that features live choirs, gourmet foods, mulled wine, whiskey tastings, and free entertainment, including a karaoke igloo. There are some great museum and science exhibits happening in Montreal in December. The first Sunday of the month you can enjoy free admission to museums such as the Montreal Art Museum (check out their website t o learn about other free admission opportunities). There are other Montreal museums that offer free entry on First Sundays and other selected dates. And of course, for a natural science history lesson tinged with a teeny, weeny taste of Ancient Egyptian history—apart from what's on display at the Montreal Museum of Fine Arts' permanent collection, this is the only location in the city where you can hope to do that so make it a point to visit the Redpath Museum located on the McGill University's downtown campus. Shopping at Montreal specialty stores and markets is an uplifting experience. You'll find a whole slew of interesting, hand-crafted, and creative goods. The biggest craft fair in Quebec, the Salon des métiers d'Art, sets up in Place Bonaventure from December 6 to 16, 2018, and provides free access to hundreds of vendors, making it a great destination in Montreal for Christmas shopping. Stock up on the best cheeses, homegrown veggies, and meats in town at Montreal's public markets, many of which will also feature special seasonal crafts and goods perfect for last-minute Christmas gifts. The Place Jacques-Cartier Christmas market and the Jean-Talon Market are both great destinations for artisanal and home-made gifts. Take in the beautiful Handel's Messiah performed by the Montreal Symphony Orchestra. Later in the month, Les Cowboys Fringants change things up with their folk-rock music. Les Grands Ballets Canadiens de Montréal’s adaptation of The Nutcracker is a Christmas tradition. The annual Andy Kim Christmas Concert starring rock and pop stars raising money for charity is a must-do. Montreal has concerts ranging from choirs to rock music. Catch the Marche de Noël aux flambeaux's evening candlelit procession on Mont-Royal followed by a fireworks display at Parc La Fontaine. Anyone can join in an evening procession featuring up to 12,000 revelers walking down Mont-Royal Avenue, candle in hand. The procession is usually held on the first Saturday of December. Just about everyone and their pet cat notices how dark it gets in North America this time of year. Enter Montreal's Luminothérapie to provide relief from the dark. At the Place des Festivals you'll find a huge playground with the installation of Impulse, a series of 30 interactive seesaws with light and sound. When the seesaws move, you'll see light and sound. Everyone loves playing on the seesaws and creating beautiful light displays. Every year just before the holidays, Centaur Theatre holds Urban Tales, a theatrical series of dark, kooky, cynical takes on seasons greetings in December. Count on bizarre, enchanting, twisted stories in a cabaret setting. 2018 offerings center around funny and tongue-in-cheek Christmas tales. Fireworks can be seen at the Old Port almost every Saturday in December and the 2018 season is expected to extend into January 2019. Enjoy fireworks at 8 p.m. on December 15, 22, 29, 2018, and January 5, 2019. There will also be a display on New Year's Eve (December 31) but it is not organized by Fire on Ice. While you are at the Old Port you can skate too. You can rent skates on site at the Bonsecours Basin if you don't have your own. The rink is open between December 8, 2018, and March 2, 2019. Most, if not all of Montreal's best outdoor skating rinks are open by the third or fourth weekend of December. Montreal has a good variety of skating rinks and skating trails and not all will cost you. Parc La Fontaine is a popular place for free skating. You can experience speed skating at Parc Maisonneuve. The moment old man winter drapes Montreal in a duvet of white, fun-filled winter activities become an option. Most public parks have winter sports including ice skating during December. Figured out your plans for New Year's Eve yet? Here are a few must-see Montreal New Year's Eve events for your consideration, everything from free outdoor fun to posh indoor feasts. It will be crowded but you can head to Montreal's Old Port New Year's Eve for fireworks, ice skating, and live outdoor performances. Or, dress up and head to a casino for dinner and gambling. In 2018, you can start your celebration early at the Casino de Montréal's Cabaret du Casino, where they offer a special New Year's Eve brunch beginning at 4 p.m. with a live band performance and famous dishes from Pavillon 67 restaurant.